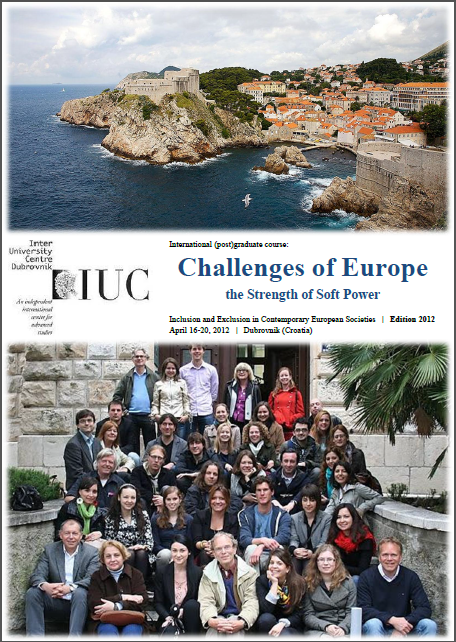 The 8th (and latest) edition of the course took place from 16 – 20 April 2012 and has ended. The 9th (and next) edition of the course will take place from 7 – 11 April 2014. The impact of the lasting financial crisis in Europe only now becomes clearly visible. The crisis leads to more severe and new forms of social exclusion within European societies and to greater differences between European countries. In this course we addressed three questions. The first and central question is what new forms of social exclusion we see developing on different levels (local, national, between states and on the level of Europe as a whole)? Can we identify these forms, compare situations in countries; can we analyse the characteristics and the mechanisms behind it? A second question is to identify the European dimension of these forms of exclusion. Where does it cross borders, in what way is it influenced by developments in Europe or by Europe. In short: what are the challenges of Europe? The last and third question is what can be done, on a European level, of these forms of social exclusion, given the fact that an intergovernmental EU has limited coercive powers and has to rely on the soft power of negotiation and compromises. During the course we approached these questions from different academic disciplines (from sociology to economics, law and anthropology) and from both an analytical perspective as well as a perspective on possible interventions and governance. Interested in our activities and experiences during the 2012-course? Click here to see the PDF-version of the course report of this 8th edition! Included are the reports on the lectures, debates and presentations during the intensive part of the course. Besides that, the report gives people an impression of our (in)formal activities.